Description and Definition of Native American Tools: Native American Tools were made of stone, primarily Flint, the process was called Flint Knapping and the weapon and tool makers were Flint Knappers. The tools were used to make weapons for fighting and hunting including Axes, Arrows, Spear, Knives, Tomahawks. Native American tools were also used to make every other useful implements for scraping and cleaning animal hides, drilling holes in hide, wood or leather and engraving stone, bone, or carving wood. Native America tools were used to make weapons for fighting and hunting, fishing, clothing, transport such as canoes and travois, shelter and decorations and for creating art such as rock pictures. Stone receptacles were also made to hold household items and war paint pigment. Native American Indian Tribes came from a variety of different regions across the continent of North America had varied surroundings and raw materials to work with, and their environment necessitated different types of tools and weapons. The tribes made whatever they needed to survive their particular climate and lifestyle. Tribes living close to the sea valued the ribs of whales which were already the perfect shape to make into excellent bows. These tribes would also require ivory harpoons whereas plains tribes used many tools and weapons were made of wood and buffalo parts. Many Native American tools were made from a combination of items and materials. An arrow or spear had a stone or bone Arrowhead or point which was attached to a shaft or handle made of wood and arrows would also have feathers attached, all of which were held together with a cord usually made from animal sinew or with a type of glue. For additional information refer to Stone Tools. The following list of Native American Tools provides the names of the tools and their purpose and function. Flakes or Flaking: Flint knapping involved a process in which the original stone of flint to be reduced in size. Flakes of stone were broken off the of the original piece of flint to produce Native American Tools. Adze: An Adze was a stone tool with a curved blade used like a chisel to work wood making items such as canoes. Awls: Awls were bone or stone tools tapered to a point and used to pierce holes. Also used for shredding plant fibers for sewing thread and fishing nets. Arrow Straightener: The Arrow Straightener was an extremely useful tool made from an antler. Burin: A burin was a tool flaked into a chisel point for inscribing or grooving bone, stone, wood, leather or antler. 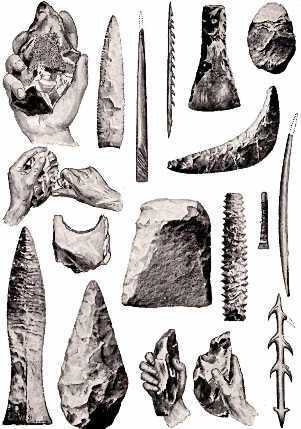 Core: A piece of flint from which flakes are removed from the core to make other stone tools and weapons such as knives, scrapers, spear pints, drills etc. Hammerstone: A hammerstone was a hard, often oblong or rounded stone, used in flint knapping. Jawbone: The jawbone of a buffalo or a horse was used by the Plains Native to create a weapon called the jawbone club. The hitting edge of the weapon would be sharpened and the teeth inside the jaw bone were left intact. Knives: Tools which were flaked to form one or more cutting edges. Knives were essential tools used for cutting meat, hides, wood and food. Needles: Small sewing needles made of bone with punched eyeholes. Used together with thread made from plant fibers or animal sinew. Scrapers: Scrapers were tools made from a flake of flint that has small flakes removed from one side to create a working edge. Suitable for scraping and cleaning animal hides. An End Scraper was a heavy duty tool that was used for scraping fur from animal hides and removing the fatty tissue from its underside. The materials used to make Native Indian tools were from the natural resources available to the Native Indians. The stones used to make Native American Tools included those on the following list. Each type of stone had different properties, some were hard, some were brittle, some were heavy and each were used and chosen to produce the required tool. An example of this is that flint, a hard kind of stone that splits into sharp splinters called flakes when struck by another hard object, or tool. The tool used to smash flint was called a hammerstone which made with a hard, oblong or rounded stone.